It is with profound sadness that we announce the passing of Mary, our loving and devoted mother and friend to all whose lives she touched, on March 24th, 2019. Beloved wife of the late Martin Ancker, for 56 years. Much loved Mother of Joanne (Brian), John (Kathy) and Susan. Survived by her sister Siena Ancker and brother Hein Westerbos. Mary was born in De Kwakel, Holland May 5th, 1925. After World War II, she met Martin and they were married September 25, 1951. They immigrated to Canada in November 1951. After enduring a turbulent 10 day crossing across the Atlantic, they arrived at Pier 21 in Halifax, Nova Scotia. Mary said she would never get on a boat again, and she didn’t. Sponsored by a farming family they started their life in Canada. They learned English as they went. Mary was an amazing seamstress. She made her own wedding dress and most of the clothes for the three children. 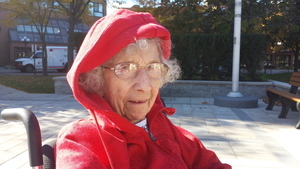 She was an avid card player(shark), an active volunteer and devoted Catholic. Her life was dedicated to her family and friends. Reception at Holland Christian Homes- Horizon Hall 35 Kingknoll Drive (Off McLaughlin) Brampton, Ontario 12:30 to 3:00 p.m. Consider providing a gift of comfort for the family of Mary Ancker by sending flowers.